Do you remember playing on a trampoline in your backyard as you were growing up? Summers were surely so much fun, and you’d definitely want that same kind of experience for your own kids. If you’re searching for high-quality trampolines and good deals, you may want to check out this link on trampolines for sale. But before you head out and choose a trampoline for your children, here are the top considerations you should make to ensure your children’s safety while they’re having fun. You need to check on how much weight a trampoline can safely tolerate. Manufacturers will usually indicate if the weight limit can only accommodate one person at a time, or if it can have a few children playing on it. Bigger trampolines can tolerate heavier weights. Trampoline brands specify the maximum weight limit of their varied products and models. Purchase a trampoline that meets your family’s needs for exercise and recreation, and make sure to stay within the weight limit. Enclosures are safety nets that surround your trampoline. They prevent jumping children from falling out of the trampoline onto the ground. Although enclosures aren’t a must when you purchase a trampoline, it’s highly advisable that you do. You could prevent many accidents or fall injuries by making sure an enclosure keeps your child safe and in the trampoline while their playing. If you’re buying a trampoline for kids who are younger than 5 years old, look for handlebars on the trampoline model. Very young children aren’t yet stable jumpers, so they’d be safe to have handlebars to hold onto while playing on the trampoline. Trampolines come in a variety of shapes. Here are the things you should take note of when you choose the trampoline you’ll buy. This trampoline shape is the most popular one. However, keep in mind that this design tends to drive its jumpers towards the center of the trampoline. If you just have one child playing, a round trampoline would suffice. However, if you have more than one child playing on the trampoline at any given time, you may want to choose a different trampoline style to avoid collisions between players. Oval-shaped trampolines feature a larger area for jumping on, as compared to round trampolines. Because of this, the oval trampolines are better if you have multiple jumpers at a given time. If you only have one child playing, the advantage of an oval trampoline is that it gives your kid more space to jump longer distances. Square-shaped trampolines offer different advantages over round and oval ones. Because the springs on square trampolines are positioned differently, jumpers maintain their places more easily. They’re not pushed by the springs towards the middle of the trampoline. This feature reduces the risk of children bumping into each other while bouncing. So, consider this when you’re shopping for a trampoline. 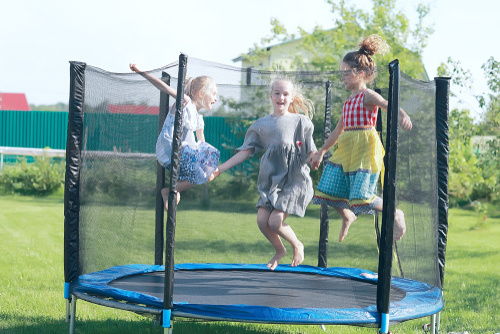 Rectangular trampolines also keep jumpers bouncing in place, as well as giving players the largest area for playing as compared to all the other shapes. So, if you have quite a sizeable playgroup of about 5 to 6 kids, opt for a large rectangular trampoline. Before you even bring home a trampoline, measure the space in your yard where you want to place it. Make sure there’ll be enough clear and safe space around the trampoline, especially if you don’t get an enclosure for your kids’ trampoline. Ideally, there should be about 3 to 6 feet of clear space around the perimeter of the trampoline. Check as well that you’re placing the trampoline on a soft but firm and level surfaces, such as grass or soil. Don’t put your trampoline on a sloping surface (no matter how slight) and never on a concrete surface. Where you place your trampoline is critical to your kids’ safety. Do your homework properly, and research thoroughly about different manufacturers of trampolines. Read the reviews posted on various sites such as Amazon or Better Business Bureau. Pay close attention to customer complaints, and see how the manufacturer responded to such negative reviews. Purchase from a manufacturer whom other parents can vouch for in terms of safety and customer service. Playing on a trampoline is quite a good alternative for kids when they’re enjoying the day outdoors. To give you peace of mind and to ensure your children have the time of their lives bouncing on their trampoline, keep the aforementioned guidelines in mind when you purchase one for your family.